will still deliver the superior style and luxury they are accustomed to. feasible that if consumers follow this daily routine, they will only need to fuel the car but once a year. This means it will not only cut down on pollution and global warming, but on a consumer’s gasoline budget as well. hybrids have the potential to augment the planning of cleaner electrical power plants, ultimately producing a dramatic effect on our society and future generations. consists of a small gasoline engine that turns the generator, which charges the lithium ion battery pack, powering the electric motor and turning the rear wheels. 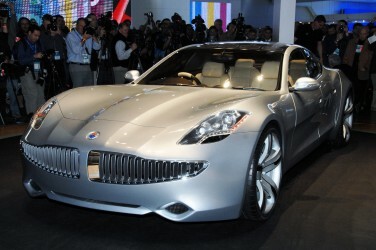 This Q DRIVE technology will provide a base for all future derivatives from Fisker Automotive. roofs or garages where they can generate electricity during the day to charge the car overnight…again cost and emission free. Two Driving Modes: The driver will be able to select between two modes of driving. The first mode is Stealth Drive, which is the quiet economy mode for optimal relaxed and efficient driving. By flipping the second paddle behind the steering wheel, the car will switch to Sport Drive, which will access the full power of the vehicle.